Nigerians who reside in Europe, America or South Africa are always in dare need of Ogbono soup. It is also called Obgolo or Etima Seed, when grounded and mix with any vegetable and spices and cooked with fish or meet, it make people feel at home wherever you eat it. Nigeria’s ginger is one of the best across the world. This is one of the most traded spices in the world which Nigeria happens to be among the largest producer too. 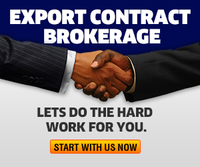 You can start a Trans-Sahara or Trans-Atlantic trade with this goods and be making dollars on regular basis. Garlic is on top of the list of items you can export from Nigeria. 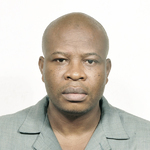 It is a cash crop which is grown under irrigation by farmers in the Savanna areas of Nigeria. With internationally certified good quantities of garlic, you can be sure of foreign hard currencies. The Niger Delta region in Nigeria is blessed with rich organic deposits of Shrimps. The demand for Shrimps is high in countries like Portugal, France, Belgium, Spain, Europe and USA. (Pure) honey is primarily composed of fructose, glucose, and water. It also contains other sugars as well trace enzymes, minerals, vitamins and amino acids. Honey is manufactured in one of the world’s most efficient factories, the beehive. Honey is currently priced between 12.00 and 15.00dollars per kilogram at international market. At the Nigerian market, genuine pure natural honey cost between 1500:00-2000:00 Naira per litre. If you have the capacity to produce snails in large quantity, there is always a ready market for your product. Snails are hotcake in Europe countries and the America. Another good thing about this is that it is easy to rear as it produces rapidly with close to zero funding in terms of feeding. 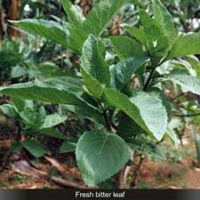 Bitter leaf is derived from the leaf of a small ever-green shrub; true to its name, the leaf is always bitter to taste, but delicious in meal if well prepared. It is equally in high demand by the herbal industries as it can be used mostly for herbal medication. We all know that cassava is a regular food for all in Nigeria because of various methods of its preservation and ways of preparing it. Demands for a well processed cassava flour is on the increase both in Europe, Middle East and in America. So, lets take the advantage, consult The Thy Global for assistance. 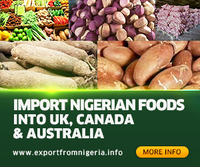 Almost every part of the country, Nigeria has the potential to produce Cashew Nuts as an international commodity. 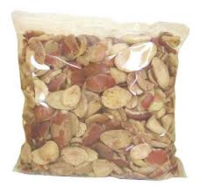 Great quantity of unprocessed raw cashew nuts are exported regularly to India, Brazil and Vietnam where they are processed into kernels and moved to the Northern America and the Europe where they are sold for about 2 dollars per pound. You need to learn about how to export food items first. See: www.foodstuffexportinnigeria.com for detail.